Does anyone have a photo and any background history of 1823 jail locks? Any help would be much appreciated. PS- I posted this reproduction is it close?? I think understand what you are referring to now. You are referring to the reforms of British Prison of the 1823 Penal Act. I am inclined to agree with Gmanphotog that the padlock is relatively modern (perhaps mid-20th century). I have one nearly identical in shape, rivet positions, etc. Although it isn't marked "Made in India," there are several things that suggest this such as a misspelling - GUARENTED. Also, the maker is not honest when he inscribes 10 levers on the keyhole cover. I can't see an American or British company being able to get away with this. Below are 2 photos of my padlock. I do have to admit it's solidly constructed. Oop! I didn't post the picdtures. Here they are. Since the manufacture of any locks was centered in CT and didn't start there until 1831 it is unlikely that locks used in 1823 were made in the US. They may indeed have been Chubb locks if they were mounted to cell doors, but if they were padlocks it is most likely they were of the economically produced Scandanavian type and very likely had bull ring shackles. I really don't want to flame a US versus UK war, but I think there more evidence suggest what he is referring is something manufactured across the pond. The question is what happening in 1823. It may not be a patent, but a Royal charter. The 1820's was a period when Chubb first expanded into detentions locks as Chubb archive article I linked to previously stated. Initially with padlocks, which as the article stated, became very popular in other countries, the US included? Don't know- probably. 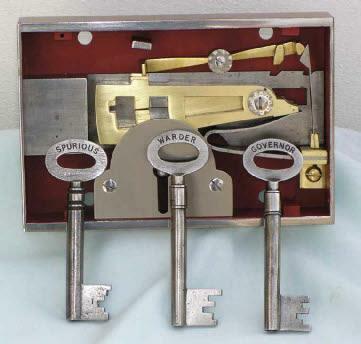 They also patented a dedicated prison lock in 1824, which is one I pictured. But as BBE pointed out during this period in the US, dedicated locks were rarely used. But what is significant about 1823 is its the year Chubb became the official lock of the Royal family. Chubb locks carried this seal well after 1823, and certainly would have increased there esteem in the US. And a Chubb brother was making locks in the US at the time. Also the lock the posted put up is Mickey Mouse shaped lock. The reason why 90 percent of the forgeries on EBay have a Mickey Mouse shape is that was shape of early Chubb padlocks. So I think 1823 refers to the Chubb Royal seal. Thanks all for the history and your collective experience! It much appreciated and will be shared with my client who is restoring a jail from circa 1823. This is new for me as my business is creating reproductions of door and window hardware from the late 1800s. So what I gave I should be looking for a Scandinavian style lock, which I will pay top dollar for 12 locks with keys. My client is fine with a reproduction, however, I want to make sure it is historically accurate down to the metal type, etc. While you seem to have read my post you obviously didn't understand what I wrote. I didn't say no locks were made in the US, what I said was that manufacturing started in 1831. 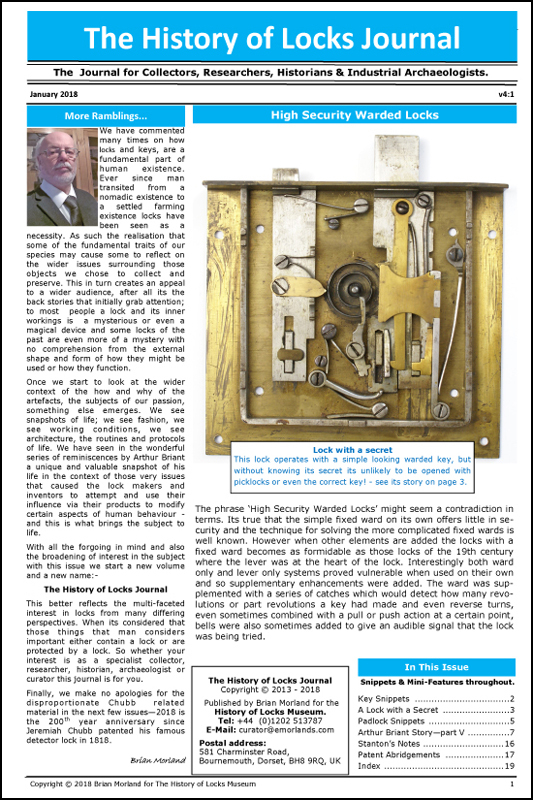 You can find that information in Tom Hennessy's book Early Locks and Lockmakers of America. Before manufacturing in the US most latches were made outside of the US or by blacksmiths in the US. I seriously doubt that a jail was fitted with those blacksmith locks. Actually by examiningTom's book there were some 18 patents prior to 1831 but like many patents I see no indication that any of them were produced beyond the patent odels required at that time. In cheecking my own files I find that there were as many as 20 X patents for locks but again no indication of manufacture. It is too bad we can't get copies of all of those X patents but they went up in flame when the patent office burned. Jails in the US were being locked with padlocks as late as the mid 1800's, especially in the west. If the padlocks didn't have a bullring shackle they were typically used with a chain. As near as I can tell fixed locks weren't used in very many jails until the late 1800's.